Information for questions regarding your Marine's hazard pay, per diem rates, housing costs, W2 forms, and more. There are many components to Military Pay. There is basic pay, special pay, incentives, allowances, and sometimes retirement pay, for those that serve long enough. 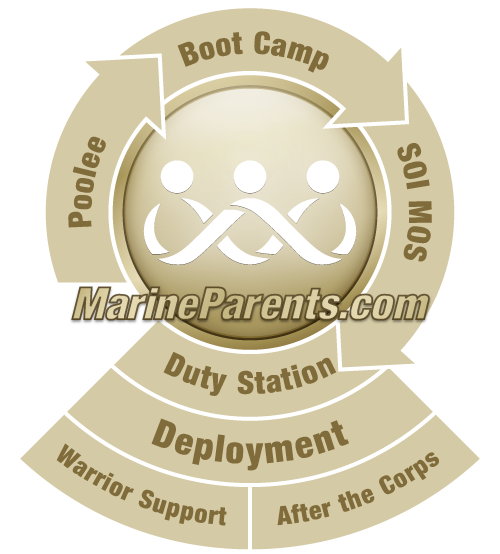 This page will explain the differences in the pay your Marine may receive during their career in the Marine Corps. Basic Pay is the most fundamental component of a Marine's pay. A Marine's rank and years of service will determine the amount of basic pay a Marine will receive. To view the pay charts for active duty and reservists click here. This site also provides the pay raise percentage annually since 2007. Hardship Duty Pay (HDP)- Hardship duty pay is additional compensation paid to service members assigned to locations where living conditions are substantially below those conditions in the continental U.S. (CONUS). Hostile Fire Pay/Imminent Danger Pay (HFP/IDP)- Hostile Fire/Imminent Danger pay is when a Marine is in immediate danger of being attacked. There are areas designated by the DoD and Marines in these designated areas will receive this pay incentive. Assignment Incentive Pay (AIP)- Assignment Incentive Military Pay is the military's preferred way to compensate troops from all services. Assignment Incentive Military Pay is often paid to service members for unusual assignment circumstances. Hardship Duty Incentive Pay (HDIP)- Hazardous Duty Incentive Pay applies to servicemembers, who under competent orders, perform hazardous duties such as flying duty as non-crewmembers, parachute jumping, demolition of explosives, handle toxic fuels, engage in flight deck duty or experimental stress duty. To learn more about these special and incentive pays click here. Marines receive several allowances that help offset different costs and provide for specific needs of the Marines. The following allowances may be offered to Marines if they qualify. Basic Allowance for Subsistence (BAS)- provided to offset the costs of a Marine's meals. Basic Allowance for Housing (BAH)- provided to offset the costs of housing when a Marine does not live in the barracks. Dislocation Allowance (DLA)- partially repays Marines for expenses incurred when relocating due to Permanent Change of Station (PCS), or other circumstances. Family Separation Allowance (FSA)- A Marine with dependents who serves an unaccompanied tour of duty may be entitled to a family separation allowance. Family Subsistence Supplemental Allowance (FSSA)- designed to help families, who even with their other allowances, struggle during these tough economic times. To learn more about these allowances click here. Marines who serve long enough are eligible for different retirement plans. You can view those retirement plans here. It will depend on the retirement plan chosen, but 10 years is the minimum service time to qualify for the Final Pay and High-36 retirement plans. With these two plans a veteran will receive 25% of the basis for the retirement plan. The percentage will go up after the 15 and 20 year service mark, and then for each additional year of service time. Calculate military pay based on rank, years in service, dependents, etc. Links to military pay and the online W2 form for taxes. Must have login and password to access. This interface is for your MARINE's access. Perform interactive foreign exchange rate calculations on the Internet, using live, up-to-the-minute currency rates. From the DFAS (Defense Finance and Accounting Service) web site. Includes Pay rates for current and prior years as well as specific information on Procedures and policies, Veterans Benefits and Health Care Improvement Act of 2000, OSD Military Compensation, Garnishment, Thrift Savings Plan, Uniformed Services Participation, Information for Taxpayers Serving in the Armed Forces, Savings Bonds and much more. Take a look if you've got a question about Military Pay. This is a page from the "Per Diem, Travel and Transportation Allowance Committee" web site. Includes COLA, Housing, Per Diem, converters for pay from overseas locations, and more.